Tired of air conditioning bills and don’t really want a break out a noisy fan, then consider the VU5551 Turbo Silence 16-Inch Pedestal Fan. It just may be the best fan on the market today. How quiet is it? The company says its test indicate it ranks from 40 to 57 decibels, comparable to the noise level in the library. In fact, we didn’t even realize it was on unless we were looking at it. It’s like having an air conditioning unit in your window but quieter. It’s so quiet that it won’t disturb television watching or even your sleep. The fan is noted for its air flow and quiet blades that pushes air up to 2,436 cubic feet per minute. That’s a lot of fresh air. 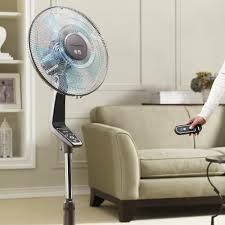 The four-speed oscillating fan also pivots up to 90 degrees in all directions. The fan also is adjustable, but you can also purchase a small 12-inch desk fan if space is an issue. The larger fan we tested can be extended up to 54 inches. It’s easy to lift with a handle and is quit stable even at the highest speeds. No more concerns about having it fall over when it is really blowing. Call it a guy’s fan. Why? Because it comes with a remote control and a turbo boost. Who doesn’t want a powerful fan but yet so quiet you forget that’s it even on? That doesn’t mean that women won’t like it, although some of the women at Baltimore Post-Examiner did say what would make it perfect is if their were dual remote controls so they could have a little control as well. The company markets the fan as ‘Turbo Silence’ and we couldn’t agree more. The five-blade fan equipped with a three button remote control, enables you to multi-task with a simple touch of a button. The remote controls the power, speed and our favorite – turbo boost. It has three mid-to-high speed settings. The remote runs on two AAA batteries, which are not included. Set up is a breeze. Takes about five minutes to put together and that’s not even looking at the directions. What guy does that anyway? However we would recommend reading the directions for safety reasons and just to make sure you are putting the blades in correctly. So many fans on the market today are a pain to clean and you end up spreading dust all over the house when you turn it on. Not this fan. The frontal grid of the fan head comes off very easily making cleaning no longer a chore. The product comes with a warranty and parts will be available to the product for up to seven years. It retails for about $120 at Amazon – a little more expensive than other fans, but you wont’ be disappointed as so many consumer reviews indicate. The fan is made in China and marketed globally, including the United States and can found at Bed, Bath & Beyond stores nationwide. 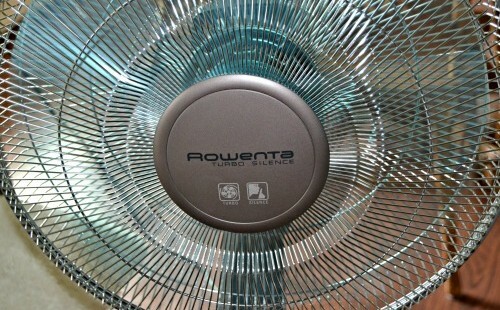 Rowenta provides products worldwide. Check out their website for additional home products. Made in China, I hope! Country of origin is important since we are living in a time where Wall Street and our own government don’t care much about US manufacturing jobs.